(Nanowerk News) A group of European researchers are developing a next generation graphene based scanner which will allow hitherto unknown aspects of works of art and other historic objects to be revealed. The equipment will enable the viewing of hidden images on canvases and unveil what is hidden inside three dimensional objects sealed centuries ago. Testing the augmented reality based application in a real scenario. As well as showing sketches or previous paintings that have remained hidden beneath a particular art work, “the scanner will allow us to see preliminary drawings or identify overpaintings”. So explains Javier Gutiérrez, researcher at Treelogic and co-ordinator of Insidde, the Seventh Framework Programme – European Union funded project within which this work falls, and in which eight organisations from five European countries are participating. The scanner allows the way in which the brushes have been applied to be observed, information which is opening up new fields of work for the scientists of Insidde: “The scanner may show details on how a painting was made that are of great art-historical value, because they tell us more about how the painter worked; these details are also extremely helpful for conservators when preparing for the restoration of paintings”, notes Laurens van der Maaten from Delft University of Technology. Although the scanner is still in its trial and calibration phase, the researchers have already managed to use it to identify some of the materials found in specific works of art. This is a result that experts from the participating museums have been very positive about. In the words of Marta Flórez (Museum of Fine Arts of Asturias), “we didn’t expect to get this type of information, but with the prototype we have been able to clearly distinguish between some pigments, which in some cases will avoid having to puncture the painting in order to find out what materials the artist used”. Besides inspecting paintings, which have a planar surface, the researchers are testing and adjusting the scanner in order to be able to generate images of sealed three-dimensional objects. For this, a structured-light scanner will be combined with the terahertz scanner. (a) Still life. (b) Reproduction used for test and validation purposes. (c) Samples to be analysed with the terahertz scanner consisting of multiple pigments found in the original painting. Geert Willems, Director R&D of 4DDynamics explains the benefit: “By reconstructing the 3D shape of the objects, we can help guide the terahertz scanner to the optimal positions around the curved shape of the objects, while making sure the scanner does not come in actual contact with the artwork”. In the near future they will be scanning various Bulgarian pots from the 3rd century which were sealed when they were found, and whose contents are unknown. Reneta Karamanova, restorer at the Regional Museum of History Stara Zagora, adds "Another valuable application of the scanner to archaeologists and restorers is its use to identify painted, carved or embossed decoration of pottery on which surface there are deposits of dust or limestone. The ascertainment of the condition of the ceramic surface by terahertz analysis would prevent the damage that can be caused to the vessel by manual cleaning of the deposits." The graphene scanner is seen “as a new instrument which in no way damages the materials being studied and which will extend the investigated spectral region, and make more accessible the use of THz imaging analysis in the world of art” comment Raffaella Fontana and Marco Barucci from CNR-INO, who participate in the development of the focusing system. Mounted on what is referred to as the “XYZ table”, which measures 1.50 x 1.50 metres and is 1.20 metres high, the scanner comprises multiple heads which incorporate graphene emitters and receptors and can move three-dimensionally across the 2 square metre work area. With regard to whether this scanner could replace the other methods that exist for obtaining hidden images in works of art such as scanners using x-rays, infra-red or ultraviolet radiation, the researchers at the University of Oviedo, in charge of the system, are quite clear: “Each frequency range has a different capability in terms of penetrating the different layers of a piece of work, so the information that is recovered with each technique is complementary to the others”, explains Samuel Ver Hoeye, technical coordinator of the project. (a) Ceramic from the III century. (b) Setup for 3D acquisition with a structured light scanner. (c) 3D model resulting from raw data before post-processing. Considered one of the materials of the future, graphene is formed by carbon atoms in a single layer only one atom thick. One of its many peculiarities is that, when submitted to electromagnetic waves, it behaves in a non-linear way. In other words, “It functions like a kind of frequency multiplier. If we make a wave of a particular frequency impinge on graphene, the graphene has the ability to emit another, higher, frequency”, agree David Gómez and Nuria Campos from ITMA Materials Technology. This property of graphene is allowing scientists to emit, in the terahertz band, a band of frequencies which until now have mostly been achieved in experimental settings and which are lower than infra-red but higher than the frequencies used by mobile phones and satellite communications. For this reason, “beginning to use it means filling a niche that exists between the frequency bands of other technologies that have already been developed”, acknowledges Javier Gutiérrez. Beyond disseminating the results of their work in specialised international conferences, one of the priorities of the Insidde project is to ensure that the results also reach the general public, and as such the researchers will be making the images discovered by the graphene scanner publicly available. 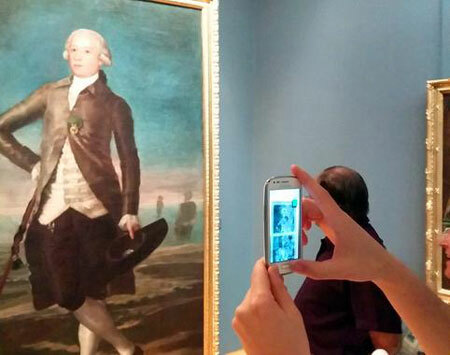 In this vein, the consortium is developing various means by which to popularise this new knowledge, for example through an augmented reality app for mobile phones which can be used in museums and art galleries. And, without having to leave home, the images can be seen on the internet through the open network Europeana. Led by Treelogic, the following seven organisations from five European countries are participating in the Insidde project (Integration of technological solutions for imaging detection and digitisation of hidden elements in artworks): from Spain, ITMA Materials Technology, the University of Oviedo and the Museum of Fine Arts of Asturias; from The Netherlands, Delft University of Technology; from Italy the Istituto Nazionale di Ottica; from Bulgaria, the Regional Museum of History of Stara Zagora, and from Belgium the company 4DDynamics.